Yes, it’s true — pretty much everything at Costco comes in gargantuan sizes. But when you crunch the numbers, most of the time buying in bulk equates to hella savings for you. And some of the best bargains to be had are in areas you may not have realized. The secret to spotting a deal at Costco is to know the unit price of the item at your regular retail store. Finding the unit price is easy: The next time you’re at the grocery store, look closely at the price tag. There beside the price, usually in really small type, is the unit price. Jot it down in your phone so you can quickly cross reference it the next time you’re at Costco. Shopping at Costco can sometimes lead to shock at the register, but when you price out your total cost savings and factor in only really needing to visit the store about every three to four months, you’ll quickly see that the initial spend more than pays for itself over the long run. Here are eight of the best items to save on at Costco, and how much you can expect to save on average. For comparison, like items were compared to like. Kirkland Signature is Costco’s house brand, so Kirkland Signature products were compared to a major grocery store’s house brand, while brand name products were compared to brand name products. Is there any phrase that has caused more meltdowns than “Batteries not included”?! Thankfully, batteries are a great deal at Costco and one of the items where “Costco-sized” is really the perfect size: 48 disposable Duracell AAs will set you back just $26, compared to $38 at a big-box store, for a total savings of $12. Costco is a baker’s paradise. Everything from staple ingredients like butter, flour and sugar to baking accessories like parchment paper and aluminium foil is available at a significant savings here. Just make sure you’re going to use what you buy — a giant tub of coconut oil is only a savings if you use it all. Flour: $15 for 20kg at Costco; $16.50 for 10kg at the grocery store. You save $18. Butter: $3.50 for 454g at Costco; $6 at the grocery store. You save $2.50 per block. Maple Syrup: $14 for 1 L of organic at Costco; $29.30 for 1 L for at the grocery store. You save $15.30. Olive oil: $23 for 3L of Bertolli extra light tasting olive oil at Costco; $12.49 for 1L at the grocery store. You save $14.47. Aluminum foil: $12 for a 3-pack of Alcan 100-foot boxes at Costco; $7.50 per 100-foot box at the grocery store. You save $10.50. Parchment paper: $12 for 2-pack of 50-metre boxes at Costco; $3.49 for 1 10-metre box of grocery-store brand parchment paper. You save $22.90. Granola bars often go on sale at Costco, and this is the time to stock up. Recently, a 36-pack of Nature Valley Sweet and Salty bars were on sale for $7 (compared to the regular price of $12). A 32-pack at a regular retailer is around $12 dollars, which makes Costco’s sale price almost 50 percent cheaper. An 18-pack of Clif Builder’s Protein Bars at Costco is $19.80, and to buy the same amount from the grocery store would cost over $10 more. Ok, so the smallest bag of nuts at Costco clocks in at whopping 1.13 kg, but nuts freeze really well, and when you compare the price to the grocery store, the savings are too good to pass up. Almonds: $17 for 1.36 kg at Costco; $27 for 1 kg at grocery store. You save $19.72 for the equivalent amount. Cashews: $26 for 1.13 kg at Costco; $5.29 for 100 g at grocery store. You save $27.59 for the equivalent amount. Walnuts: $20 for 1.36 kg at Costco; $26 for 1 kg bag at grocery store. You save $15.36 for the equivalent amount. 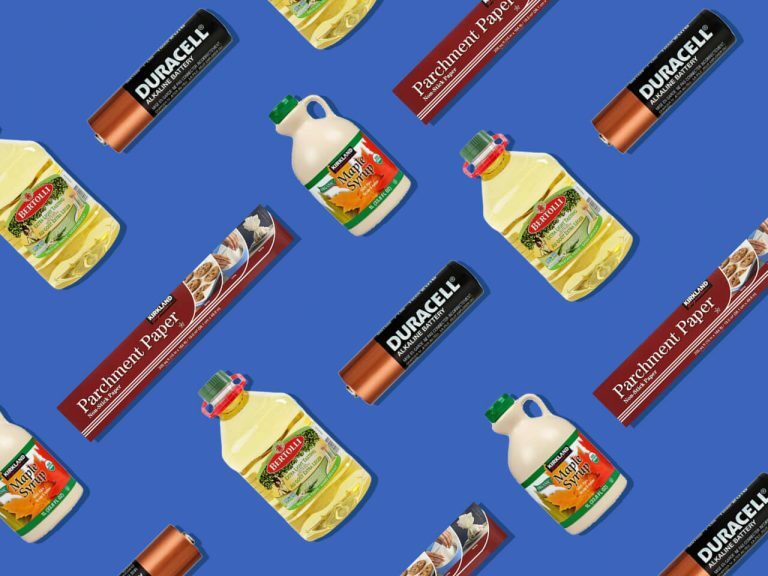 These items can often make your grocery bill skyrocket. Costco to the rescue is this area too! Centrum Women Multivitamins: $26 for 250 capsules at Costco; $15.50 for 90 capsules at grocery store. You save $17.06 for the equivalent amount. Advil 200 mg tabs: $20 for 280 tabs at Costco; $12 for 100 at grocery store. You save $13.60 for the equivalent amount. Align Probiotic: $50 for box of 63 capsules at Costco; $34 for box of 28 capsules at grocery store. You save $26.50 for the equivalent amount. From former pink-tax items to skin- and wound-care, Costco really can’t be beat on some of these personal care essentials. Dove bar soap: $15 for 16 bars at Costco; $4.50 for 2 bars at grocery store. You save $21. Aveeno Positively Radiant facial moisturizer: $25 for two 120 mL bottles at Costco; $23 for one 120 mL bottle at grocery store. You save $21 for the equivalent amount. Aveeno Moisturizing Body Lotion: $19 for two 600 mL bottles at Costco; $12.50 for one 532 mL bottle at grocery store. You save $9 for the equivalent amount. Dove Daily Moisturizing Shampoo and Conditioner: $8.90 for one 1.18 L bottle each; $9.50 for one 750 mL bottle (.753 100ml) each. You save $12 for shampoo and conditioner combined. Tampax Tampons: $15.80 for box of 108 at Costco; $8.50 for box of 40 at grocery store. You save $7.15 for the equivalent amount. Band-aid brand bandages: $16 for variety pack of 200 at Costco; $5 for variety pack of 30 at grocery store. You save $17.33 for the equivalent amount. 3M Scotch-Brite Lint Rollers: $12 for a 5 pack of 80-sheet rollers at Costco; $4.50 for one 60-sheet roller at grocery store. You save $18 for the equivalent amount. Lysol Multipurpose Cleaner: $10 for one 4.26 L bottle at Costco; $4.50 for 1.2 L bottle at grocery store. You save $5.98 for the equivalent amount. An asterisk in the top right corner of the price tag means the item will not be restocked — the product is either being discontinued, is seasonal (like decorations), or is getting new packaging. So if you like the asterisked product, stock up while you can. You don’t need a membership to shop on the Costco website, but non-members are charged a 5 percent surcharge and shipping fees may apply. The website product availability is not the same as in-store, and is quite limited in some areas, but there are some online exclusives (like funeral accessories, commercial appliances and boats). If you have a Costco cash gift card in hand, you don’t need a membership card to enter the brick-and-mortar store, but you do need to be a member to buy one (both in-store and online). WATCH: Is a $900 robot vacuum worth the hype?